As I said in my last blog so much has happened in the last five years. I realise how focused I have been on maintaining the high standards that continue to make our business a strong. Totnes as we all know, is very individual, so we are always refining our services and opening hours to suit. Our fifth year in business is a chance to celebrate success in our town of Totnes with our team, plus a few of our clients and some Prosecco and birthday Cake! From 8pm till late on a dark evening in October we dressed up, opened up and made up goody-bags full of our luxury products and vouchers from ourselves and other traders to hand out to our guests. 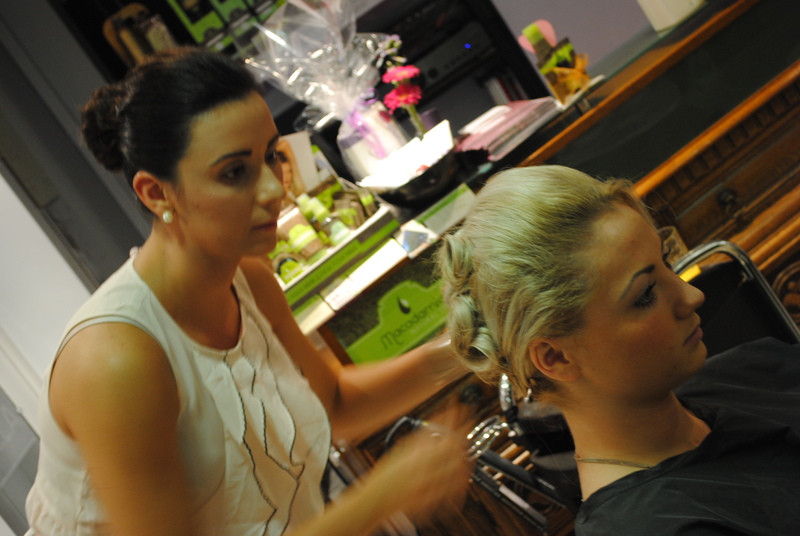 Kate, who has been with us a year and half now, did some wonderful hair-up demonstrations with staff and clients. Everyone was amazed to see how dramatically she transformed styles with only a very limited equipment and time. Kate does a number of weddings now but also helps people get that special look for parties and other formal events. We discuss our health at work all the time, and are always comparing notes on the best breakfast, recipes and what we ate for dinner last night. On Fridays and Saturdays, when we are at our hungriest we often ask ‘who has eaten all the biscuits or chocolate or cake?’ None of us is great at owning up. We invited Nutritionalist and Coach Joe Kelly to share with us some new and very well established ideas on how we can look after ourselves. He talked about the importance of good breathing and core stability to support good health. Not only did he impress people with his ability to lift the kettle bell above his head (!) but he also got an extremely positive reaction to the concept of getting fit without going to the gym. We are a family business that puts our relationship with clients, and their care, first. We are truly an independent salon. Customer service is key for us and we hope it ensures we stand out. This applies as much to the atmosphere in the salon to an individual focus at each consultation. Our team looked fantastic at our birthday evening. They all had clients at the event and we also had some new potential clients. They chatted to the new people about what they do and why working at Gill Goddard Hair is so enjoyable. They were all 2 foot taller at the end of the evening. Not just because I said how proud I was of each and everyone one of them but also because they were all wearing massive heels! Tired out by the end of the evening those shoes came off. But the smiles never did. Often at work we talk about how we are part of a community of all ages within Totnes, and often each of us becomes acutely aware of an individual customer’s needs and or difficulties. We are expanding our client base partly because people appreciate that we give our customers a chance to relax when they come to the salon. Our staff listen. They look after people and respond to their needs. Some of our customers come to the salon with a carer or a volunteer to help, and good communication essential to ensure the client has a positive experience in salon. It is important to us to support our local network of traders, volunteers and carers and so we have supported Totnes Caring for a number of years. I am delighted to say that thanks to our guests at our birthday event we raised £38 pounds for Totnes Caring through our raffle. The prizes included some of our natural nut range – Macadamia; also a year’s supply of shampoo from Wella, and a huge bag of our coffee beans (everyone says how much they love our coffee). 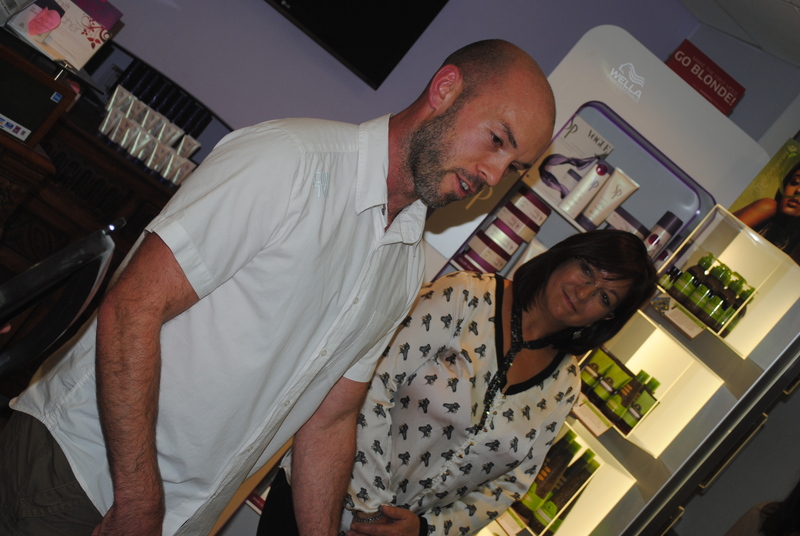 I said a few words about the team at Gill Goddard Hair and what continues to make us special after five years. We do have the best staff, of course. We invest in our staff – we are never sure if people know how important that is to us. In order to provide the best individual consultation and cut, I have that all-important but contemporary Sassoon training, and I am determined that all my staff get that kind of opportunity too, for this is the best training the industry has to offer. I will talk about Vidal Sassoon another time other (he died this year) other than to say that I respect and share the passion he had for his team. So glasses raised… to the team!